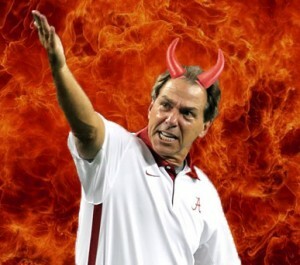 TUSCALOOSA – (CT&P) – The Tuscaloosa News is reporting that Alabama Head Coach Nick Saban held a satanic ritual at midnight last night in order to alter the path of Hurricane Joaquin. The ritual, which included the ceremonial drinking of bulldog blood, was held deep in the recruiting dungeons under the athletic office where SAT answer sheets are normally stored. Sources close to the program are saying that Saban is “pulling out all the stops” to give the Tide at least a “snowball’s chance in hell” against the Bulldogs on Saturday. The anonymous sources say that Saban feels that his strong defense, aided by hideous weather conditions, is the only hope for victory. So far the Tide’s anemic offense, led by malfunctioning cyborg Jake Coker, has been unable to generate much of anything against strong opponents. According to the National Weather Service Joaquin’s predicted storm track did indeed mysteriously change during the night. Dr. Greg Forbes, severe weather expert for the Weather Channel, said that computer models now have Joaquin taking a left turn and stalling over Athens for days before breaking up sometime early Sunday. “It’s the weirdest thing I’ve ever seen,” said Forbes. Forbes told viewers that if Joaquin follows the new predicted track it has the potential to be as disastrous as the Great Ice Storm of 2014, which dumped as much as 1/100 of an inch of frozen precipitation on Atlanta roads, causing the entire city to be paralyzed for days. “I really can’t explain why the storm is acting like this, but Georgia fans who plan on attending the game in Athens on Saturday should bring along their bass boats or inflatable rafts as a precaution. We just don’t know what will happen at this point,” said Forbes.